Regardless of business size, organizations today are embarking in a digital transformation path where IT Transformation plays a great role in streamlining processes and optimizing resources. The ever-growing IT demands keep piling up, from basic network troubleshooting and policy enforcement to optimizing service delivery and user experience, IT must be agile enough to translate business needs and align those to the existing technology. The complexity of current demands results in a substantial gap between IT execution and evolving business needs. How can IT fulfill those business requirements efficiently, making management and orchestration a much more simple task? Intent-based networking is a technology that builds on software-defined networking (SDN), transforming from a hardware-centric and manual approach to a software-centric and fully automated one, adding context, machine learning, and assurance capabilities. The objective of Intent-based networking is to create a closed-loop system that can identify, predict, and potentially respond to business needs on its own. The most important term here is Intent. When you consider intent versus actual IT execution, the power of intent-based networking (IBN) becomes clear. IBN captures business intent and uses analytics, machine learning, and automation to align the network continuously and dynamically to changing business needs. Scalability, agility and security demands associated with digital transformation require evolving network configurations, with IBN this can be automated making orchestration and management a consistent intent-based process. Adapting to new application and service requirements: An intent-based network makes it easier for you to deploy new applications, prioritize applications, and integrate with IT services and processes through APIs. Reducing risk: Through the continuous gathering of telemetry, combined with machine learning, you provide context to identify and neutralize security threats. Optimizing for innovation: You can focus on business intent; for example, which business services need to be securely delivered to which users and devices, instead of setting network and security configurations. Operating efficiently: Applying automated policy across users, devices, branches, WAN, campus, data centers, and clouds helps you respond to business needs faster. Supporting exceptional customer experience: You can improve the user experience by translating desired operational Service-Level Agreements (SLAs) and applying them consistently across the network. Achieving a truly digital network is not an easy task. Considering the ever-changing, ever-evolving demands of the digital world, the need for agility and streamline processes will continue to shape the way technology is viewed, as an enabler of digital transformation. Networks, systems, and applications must match these business demands, and the use of machine learning as a way to automate some of these processes becomes a requirement. For many organizations, the evolution to a fully intent-based network will be a journey, requiring a combination of existing and new technologies and process changes. The full potential of IBN is ultimately recognized when it is deployed across all network domains, including data center, campus, branch, and WAN. Bottom line, Yes, IBN is the future, as it will allow IT organizations to respond faster to business demands accelerating the implementation process of key applications and systems. Intent-based networking (IBN) offers a significant paradigm shift in how networks are planned, designed, and operated. Many foundational elements, including software-defined networking, virtualization, and analytics have matured to the point that they can be deployed today, as part of a longer-term intent-based strategy. 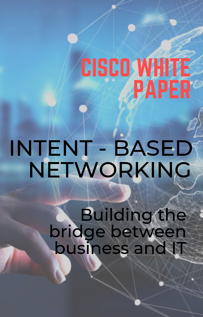 Download this white paper to understand better what intent-based networking entails and the scope of transformation it can bring to your business.